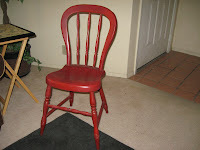 This is a super sturdy, comfortable, darling red chair that I found at a thrift store yesterday! I did not have to do a thing to it! It is perfect. 6 bucks! Wow, it's been a while, and you've done a lot! Good for you! I love the red chair. So nice you didn't have to do anything more to it. Check your previous posts, too, 'cuz I'm leaving comments!